Controversial blogger Charles LeBlanc says the Fredericton Police raided his home on Thursday morning and arrested him. Controversial blogger Charles LeBlanc says the Fredericton police raided his home on Thursday morning, arrested him and charged him with libel. LeBlanc posted a video on his blog that said eight officers showed up at his Westmorland Street apartment at about 10 a.m. on Thursday. He said officers seized his computer equipment and have charged him with libel. LeBlanc said the charges stem from comments he posted last summer about a city police officer. "I said, 'Couldn't you just take the defamation from my blog and just print it out,'" LeBlanc said. "But they took everything, right there. But my God, I said, 'now I'm at home, I got nothing. I guess the blogging is all over.'" Fredericton police Const. Rick Mooney said officers searched an apartment on Westmorland Street on Thursday and arrested an adult male in connection with an investigation into defamatory libel, which is a Criminal Code offence under Section 301. LeBlanc has not been charged. He's scheduled to make a first court appearance on the matter April 20. LeBlanc writes a blog on politics and social justice issues. He routinely criticizes politicians, the police and government officials on his blog. LeBlanc pleaded guilty on Jan. 16 to disturbing the peace in connection with a bullhorn protest last summer outside the city police station. The blogger had received warnings from the Fredericton police that people were complaining about his use of a bullhorn. The blogger had been protesting the ticket he received for riding his bike on the sidewalk in Fredericton. He's scheduled to be back in court next month to contest two infractions of the city's bicycle bylaws. LeBlanc is no stranger to controversy. No one has ever been given the full details of why LeBlanc was barred from the grounds of the legislature, including the lawn in front of the building, in 2006. Legislature officials say it was to ensure employees could work in a secure environment free of harassment. 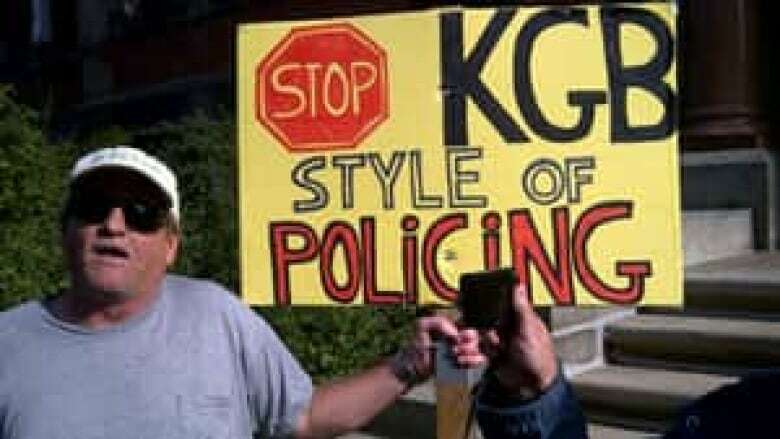 He was also arrested during a 2006 protest at a business conference in Saint John. LeBlanc was later acquitted of an obstruction charged related to his arrest at the Atlantica conference.